Camping L'Île Cariot är en camping i Chaillé-les-Marais, Vendée. Campingen har platser med stängsel, med skugga och platser med lite skugga. Det finns möjlighet att hyra husbilar och bungalows. På campingen finns en lekplats och ett sportområde. Denna inspektör gör varje år ett besök på Camping L'Île Cariot och inspekterar campingen för ca 200 faciliteter och för andra förekommande punkter. Inspektören är en medarbetare från ACSI och arbetar inte för campingen. It’s a quiet site in a quiet little town in the middle of the Marais. The toilets and showers were spotless, as was the pool. The pool was heated and a good size, with plenty of loungers, though there’s no shade. There is a children’s play area with decent climbing equipment. Canoes can be hired to explore the Marais and there are good maps available in reception. Off-road cycle routes are available though these are 2-4 km away and you have to cycle on road to get to them. Needless to say the whole area is very flat. Reception staff were very friendly and helpful and there’s a bar and snack cabin. A small supermarket is only 10 minutes walk away. This site is special ,the facilities and pool are checked throughout the day , with non intrusive staff. Try some of the walks from the site, short ones into the town or longer ones round the loch. Two supermarkets ,a street market (site will give you the days ) there is a lot to see and do round this campsite . A very pleasant, quiet site with lovely helpful staff who try their best to help. Pitches are mainly large, most are shady for part of the day. Sanitary block is kept very clean. There is plenty of hot water both in the showers and in the washing up/laundry areas. the site is situated amid the sports area on the edge of the town. There is a small supermarket and boulangerie a little walk away. Bread can be pre ordered at the site for delivery next morning. Snacks are available in the evenings. There is one of the nicest swimming pools that we have encountered, again very clean. Vill du boka campingen Camping L'Île Cariot eller få mera information? Det går bra med nedanstående uppgifter eller via campingens webbsida. 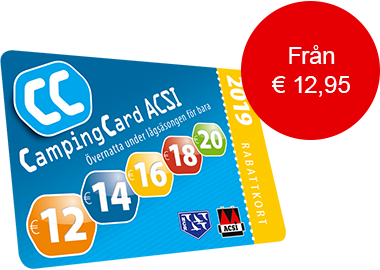 ACSI Eurocampings skickar din informationsförfrågan till "Camping L'Île Cariot".